Last night I made meringue cookies with chocolate chips in them. They are divine. I’ve been making so many, and they are eaten so fast, that now I automatically double the batch each time. Be careful before you think of doing this though, as they ALL have to fit in the oven at the same time! So I added 1 C. of chocolate chips per batch. I also made peach meringues the other day too. They were … OK. I doubled the recipe–minus ½ cup of the sugar, and replaced it with a package of peach jello. They tasted nice and peach-ish, but the rather artificial flavor of the gelatin was also there. 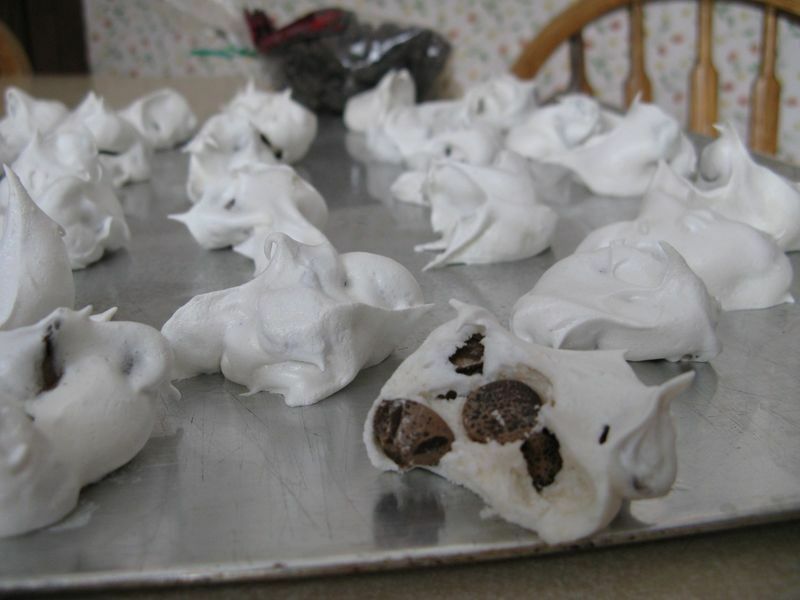 I think I’m done with meringues for a while!